How can we contribute to the well-being of the environment and continue to create imaginative design? This is the question the creative minds at Skyline Design seek to answer with each new addition to their GREENPLAY collection. They keep coming up with ingenious solutions, the most recent of which is the Airplane Activity Center which made its debut at the International Contemporary Furniture Fair (May 16-19, 2009). The playful piece, which incorporates low impact materials, recycled plastics and zero VOC emitting finishes, will have kids getting ready for take-off, while seated on the wings or tail of the aircraft. The Airplane Activity Center proves that zero-carbon air travel is certainly a possibility – if only in the imaginative minds of children experiencing this GREENPLAY environment. 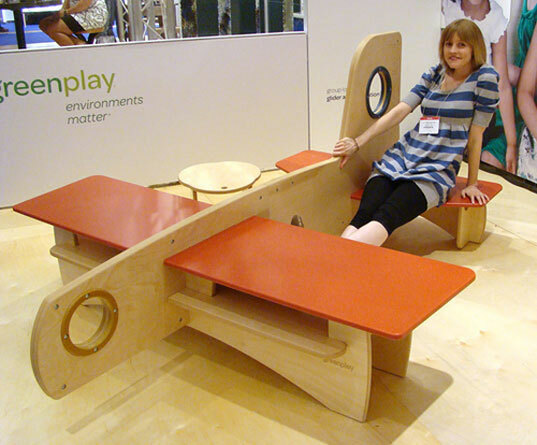 Perfect for a classroom, or a really large playroom, the new Airplane Activity Center is a sensible and sustainable alternative to the pieces that normally furnish childrens’ communal spaces. And to top it off, Skyline accepts returns of used components or whole pieces to be repurposed or donated, adding life to every GREENPLAY environment.